When looking for the best nail drill or files, look no more! These are wonderful for the professionals at their salons and home users too. Those who love manicuring and nail creativity will love these best nail file products. Whether you are an aspiring nail tech, the owner of a salon, or a teenager at home, you are in love with nail polish, nail dryers, and perhaps a single crystal, sapphire, or diamond nail file. You can even give the nail drills for nail technicians to your friends at holidays and any special occasion. This gift will always be loved and appreciated! Beginners will like the models evaluated below. The easy to use products will help you get started and they are powerful for professionals and home salons too. What do electric nail drills do? If you are still using a manual hand-held nail file, you are probably struggling to get 10 nails done quickly for yourself or someone else. These files can be used by both women and men for a perfect best nail drill manicure. Electric nail file is another name used for an electric nail drill. When you use one of these units, you’ll never go back to the plain sand paper covering on those brown paper-thin emery boards or regular nail files. You might use one for a quick fix nail snag emergency occasionally. Electric drills are easy to use, fast, and effective. They are superb for your natural nails, acrylic nails, and toenail pedicures too and are the best nail drills for nail techs. Check out the first video to see the difference when using a typical nail file or brown emery board, shown in the pictures above, and the speed of a salon drill file being used. Nails tutorial: how to shape and drill acrylic nails video. How to file, shape, and buff acrylic nails with an e-file video. This is a factor for your consideration. An electric drill stays plugged in using the electricity that is constant for keeping the RPMs up. Depending on how long you use the unit for you can get by with a battery-operated model. Batteries usually only stay charged running efficiently from one to two hours taking another few hours to become fully charged again. If you do many of hours on acrylic nails, a cordless model is not for you. Always look for battery-operated units that will run for 10-hours. When you see a number with the letter ‘K’ that stands for thousand; therefore, 30K equals 30,000 RPM (rotations per minute). Torque and RPM is not the same thing. The Luraco® Technologies has its new generation and newly released nail drill that is designed and engineered for manicures and pedicures for professionals and home users too. The item model number Luraco Pro-30K on Amazon.com® is affordable and comes in red, purple, or silver to match your nail color or your décor. Dental professionals use this as well for its smoothness and high torque for ridding teeth of ridges on natural teeth and bonding. This unit was used on my 2 front teeth bonding to make them as smooth as glass! The hand piece rotates up to 30,000 RPM with no vibration and very little noise using the standard bit 2.35 mm Colet chuck type. The body is made of aluminum and stainless-steel for beauty and durability. The control box is a slender compact size with variable speeds that you control. Take the battery-operated unit with you anywhere. The lithium-ion battery will run up to 10-hours. With the electrical thermal overload protection, the unit senses when the unit is too hot tripping the circuit breaker or fuse in your panel box not burning your hands. This is a good thing! It safeguards you and the motor as well preventing fires. The power is 110/120-Volts, 50/60 Hz (cycles). The dimensions are 5.25-inches tall x 3-inches wide x 1-inch thick and it weighs 0.7-pounds. Gift-wrapping is available for your nail buff friends and family and you will receive the unit and User’s Manual. The 1-year Limited Warranty applies for the original buyer of the Luraco® Pro-30K Electric Drill. It is made in Dallas, Texas, USA from some global components. Rechargeable, compact, drill introduction video. The Medicool professional electric file, ASIN B001QZ5LPC on Amazon.com® is outstanding for its ability to manicure and pedicure using 20,000 RPMs with high torque. The unit is rechargeable, is cordless, and portable to take with you to your clients when they can’t get to you. At your salon, you can quickly move to another area never needing to unplug it from the wall since it uses no electric cord. Home users love this battery-operated file in addition. It’s superb for those making house calls and nursing home visits. Another cool thing about this unit is that it clips to your belt liberating you to move about. The variable speed motor lets you move forward or backward, it has a twist locking chuck, and is very lightweight. You won’t need any tools to install the 3/32-inch bits. The electric file/drill runs up to 10-hours on each charge. It is quiet with no vibration to be easy on your ears and hands. Being reasonably priced, you cannot afford to be without it for the job you do. The compact size dimensions are show in the illustration on the left. Gift-wrapping is available for your nail friends and family and you will receive the unit, with User’s Manual. It comes with 1-year Limited Warranty with an optional 2-year Warranty for a minimum cost. 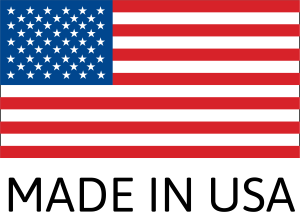 The Medicool is proudly made in the USA. Medicool Pro Power 20K™ Professional Electric File video. Medicool Pro Power 20K™ video. The Pure Enrichment® PureNails Pro nail drill item model number PENAILSET on Amazon.com® is a best-selling unit for manicuring and pedicuring nails and feet at your salon and at home. It’s affordable with many features and bits. Get your clients’ nail tips for grooming toes and fingernails to stay beautiful the year around. Both women and men can use this unit. The 7-piece best nail drill set will make those rough uneven nails smooth being trimmed and buffed to a silky luster never snagging onto your clothes or stockings. This salon-quality set comes with all that you need. It has 2 speed settings; the low setting for delicate skin areas with the higher setting for tougher spots. It also goes in either clockwise or counterclockwise directions for the area needing the most accurate turning range. You will love the grooming LED (light emitting diode) illumination to see close-up better. It is a great nail drill for acrylic nails. The diameter of the drill bits are approximately 0.39-inches to 0.6-inches (1-1.50 cm). The handle is 5-7/8-inches long—that’s 1/8-inch short of being 6-inches long. The unit weighs 1.03-pounds. Never buy batteries when using the spiral spring cord (about 3-feet coiled), and the A/C (alternating current) adaptor that plugs into the wall. Using electricity gives you more power and constancy with no downtime charging batteries. You will be able to smooth corns, remove surplus cuticle, trim, file, and shape even the most challenging thick nails and tough skin. The device does not come with an under-nail cleaner drill head. The instructions do not tell you how to clean. To keep infections from other customers, always disinfect in rubbing alcohol and let soak for 15- to 30-minutes. No one wants to get someone else’s toenail fungus that can only be cured getting a doctor’s prescription. You can also boil metal in water to disinfect then wipe with alcohol. Plug the UL® listed 3-foot coiled cord (about 6-feet outstretched) into a 110/120-Volt, 50/60-Hz outlet in the USA, Canada, and Mexico. Other countries will need to buy a 220/240-Volt adapter to use the unit. It does not use batteries; it is electric only. Gift-wrapping is available for your nail friends. It comes with a User’s Manual and 1-year Limited Warranty and is made in China. The BelleHomes US electric nail file, item model number 202 on Amazon.com® is loaded with features! The professional or home user will love it for manicures and pedicures. File acrylics, do fast and beautiful nail art, trim buff, great on natural nails to for sanding, grinding, sharpening, engraving, shining, and polishing; works on corns, calluses, and thick dead skin. It will also remove nail polish. Being electric at 4,000 to 30,000 RPMs, its speed gives you many advantages. One of those is the foot pedal to control your actions and it can be used without the foot pedal if so desired. You can use it on your pet’s nails—if they let you; a veterinarian would be able to do it the best due to their knowledge and experience with dogs, cats, and horse hoofs. Use at nursing homes and assisted living facilities, podiatrist (foot) doctor offices, at a nail salon be it finger and/or toenails, a beauty salon for hair and nails, and use it at home for you and your friends. Everyone will be delighted with the end results! The handpiece is upgraded to include a silicone rubber sleeve. You might ask Why is this so good? Silicone rubber is a rubber-like material made of silicone. Silicone rubbers are used in industry because they are non-reactive, stable, and resistant to temperatures from 131- to 572-degrees F. (55- 300-degrees C.) to maintain its purpose. Therefore, your hands and fingers will never feel hot. Vibration is slight to none and the unit will run clockwise or counterclockwise and it can be used by lefty’s and right-handed operators. The handheld device has a snap-on lock feature for safety with a cradle to hold it in. The unit is compliant and CE Certified (European Conformity). For your confidence, the CE marking is similar to the FCC (Federal Communications Commission) conformity on specific electronic devices sold in the USA. The CE mark is a mandatory compliance sold within the European Economic Area (EEA) since 1985. The mark is known globally. The mark indicates that this product meets USA requirements. Plug the UL® listed cord into a 110/120-Volt, 50/60-Hz outlet in the USA, Canada, and Mexico. The power output is 10-Watts and output current 0.80-Amps. Other countries will need to buy a 220/240-Volt adapter to use the unit. It does not use batteries; it is electric only. The 6 each 3/32-inch bits and filing heads with 5 sanding bands are easy to change and no tools are required for the task. The unit will work with any brand of 2.3 mm (3/32-inch) bits. The dimensions are 9.44-inches x 8.66-inches x 2.1-inches (24 cm x 20 cm x 5.5 cm) and it weighs 5.6-ounces (160 grams). The life of the device is about 400-hours. Note: You will see “optional” on Amazon, and it should show “included” because all things are included in the nail drill kit. Caution: Do not twist or turn the silver part in front of the white rubber sleeve because it will damage the handpiece. Comment: After each use, clean the dust wearing rubber gloves; it does not come with a suction dust device. Let it cool naturally first. Turn off and unplug the unit from the wall for safety to change the bits. Gift-wrapping is available for your nail friends and family with a User’s Manual that will be emailed to you after you buy the unit in 24-hours. It comes with a 6-month Warranty and is made in Shenzhen, China. The MAKARTT® electric file/drill appliance, item model number JD700 on Amazon.com® is a terrific unit for pros in nail salons and home users as well. The base comes in white, pink, or blue, and you can buy another handpiece here too. It is useful for gel nails, acrylic nails, and natural nails. It is low noise with low vibration. Use it for grinding, cutting, polishing, carving, nail art and removing or trimming cuticles. It can be used for pets—if they let you. 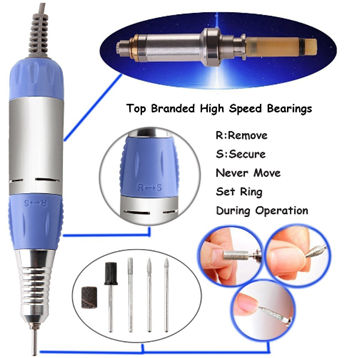 The unit has high-speed bearings, low heat with ventilation to the handpiece to cool it; low noise and low vibration. Adjust the speed to your preference from 0 to 30,000 RPMs. With the LED (light emitting diode) you will know the speed with a change in velocity (rate of speed). In a coaxial manner the maximum torque and quick lock chuck is 0.02 mm. The grinding head is easy to replace. The maximum torque is 2.0 Ncm. The set includes 3 bits and the sanding band is 180 grit. It holds all 3/32-inch drill bits of any brand. The foot pedal can be used, or you can use the hand method. The forward and reverse modes mean it turns clockwise to the right or counterclockwise to the left for right- or left-hand users. When it changes direction, it will stop for 2-seconds to protect the motor from getting confused for which way to go. The dimensions are 5.12-inches long x 5.12-inches wide x 3.15-inches tall (30 mm x 130 mm x 80 mm) and it weighs 2.2-pounds for the housing with motor and 0.353-pounds (160 grams) for the handpiece. Plug the UL® listed cord into a 110/120-Volt, 50/60-Hz outlet in the USA, Canada, and Mexico. The power output is 35-Watts and output current 0.80-Amps. Other countries will need to buy a 220/240-Volt adapter to use the unit. It does not use batteries; it is electric only. Gift-wrapping is available for your nail friends and family and you will receive the User’s Manual and a 1-year Warranty. It is made in China. The UTILYZE 10-speed powerful unit, ASIN B01F4KCK5I on Amazon.com®, is a best-selling pro or home user drill for filing, buffing, smoothing and removal of calluses and cuticles at a salon or home-based business. Use for manicures and pedicures with the motor speed that’s best for you and the function you are performing. It is lightweight to work with natural and acrylic or any synthetic nails. You can turn the rotating device either clockwise or counterclockwise for the direction that’s best for your procedure and it fits left- or right-handed users. The LED (light emitting diode) is cool and can be detached. The cover is also detachable. A good thing is its ability to trap dead skin and nail tissue, so you never have a mess. The unit is portable to take with you and has a travel case to put it in. You will have 7 sapphire coated best nail drill bits including a cylinder milling cutter, felt polishing cone, fine shaping disk, flame milling cutter, rough shaping disk for ingrown nails, callus cutter for thick nails, and sapphire cone for removing thick hard skin mostly on the feet. Plug the UL® listed 7-foot cord into a 110/120-Volt, 50/60-Hz outlet in the USA, Canada, and Mexico. Other countries will need to buy a 220/240-Volt adapter to use the unit. It does not use batteries; it is electric only. Gift-wrapping is available for your nail friends and family and you will receive the User’s Manual and a 3-year Warranty. It is made in China. UTILYZE 10-in-1 Professional Electric Manicure and Pedicure Set review with demo video. Read customer reviews at Amazon.com® where users are honest and straightforward. You can ask questions before you buy as well. These buyers and users will give the best opinion for your decision-making for nail drill files. Check several brands and read those customer reviews. You want to know about functionality, any flaws, and hidden defects. With the information here for the top best brands we consider being good quality and affordable, you should have a good amount of data to help you in your choice. Happy shopping!